eN arts is pleased to announce that our first exhibition of the year 2019 will be “Kishio Suga”, presented by the eN arts collection, in collaboration with the Tomio Koyama Gallery.” This exhibition will showcase one of the artists from our collection. Kishio Suga is a leading member of Mono-Ha (School of Things) and is well recognized globally for the originality of his works. This solo exhibition will be his first in 21 years in the Kansai Area, with his last one being held at the Itami City Museum in 1998. 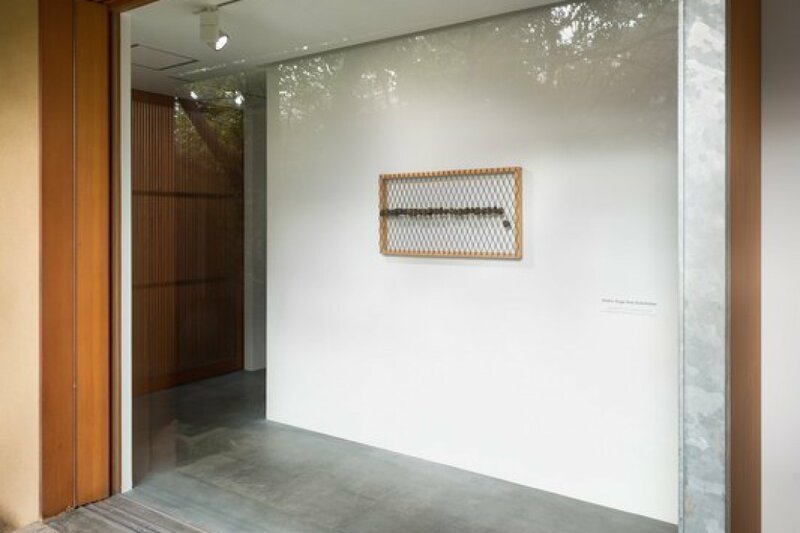 We would like to thank the Tomio Koyama Gallery, which represents Suga, for presenting 17 pieces of Suga’s work (1975-2017) in addition to those from the eN arts collection. Mono-ha (School of Things) sprung from a group of artists who radically redefined Japanese art during the late 1960s and early 1970s. Mono-Ha artists explore the encounter between natural and industrial materials, such as paraffin, stone, steel plates, glass, light bulbs, cotton, sponge, paper, wood, wire, rope, leather, oil, and water by arranging them in mostly unaltered, ephemeral states. 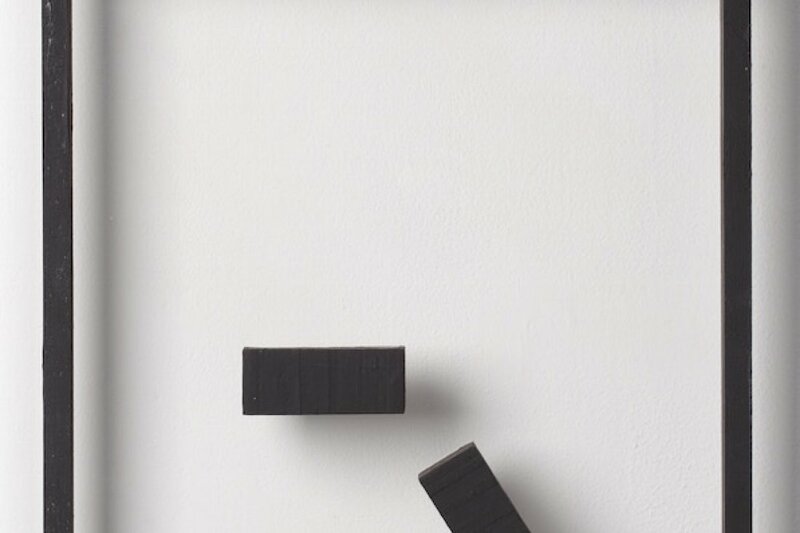 Their works focus as much on the interdependency of these various elements and the surrounding space as on the materials themselves. For Mono-Ha, materials are not just media to construct art works. Materials are also simultaneously the subjects of their artwork, a concept that enabled Mono-Ha to become a new movement within Japanese art from that time. As the Mono-Ha matured, Suga established his own expression of “the existence of Mono / Things”. My personal point of view is that Suga attempts to express “the existence of Mono” — “front (visible side) and back (invisible side)” and “kekkai (a term from the traditional Japanese tea ceremony)” — the sacred boundary: this side and that side. Suga’s works act as a main driver to connect and divide / separate and bond “the viewers and the venue” or “the viewers and the works themselves” while standing still. Suga’s works allow the viewers to guess about what exists on the invisible side of the works from the point of view of the visible side. They also act as a key to untangle the relationship between the viewers and the space. eN arts is located inside Maruyama Park which was, until the beginning of the Meiji Era, part of the Yasaka Shrine grounds. Please enjoy Kishio Suga Solo Exhibition to witness how Suga’s works, old and new, will inspire viewers at eN arts, a 100 year-old Sukiya style Japanese architecture renovated to a contemporary art gallery. Born in Morioka city, Iwate Prefecture, in 1944, Kishio Suga graduated from the Department of Painting of Tama Art University in 1968. In 1967, he won the 11th Shell Art Award. From his first solo show in 1968 until today, in a career spanning over 45 years, he has shown work in a vast number of exhibitions in Japan and abroad. In Japan, “Kishio Suga Solo Exhibition” at the Vangi Sculpture Garden Museum in 2014-2015, and “Kishio Suga: Situated Latency” at the Museum of Contemporary Art Tokyo in 2015, are his major solo exhibitions in recent years. These exhibitions ignited discussions about contemporary aesthetics. In the decades since he represented Japan at the 38th Venice Biennale in 1978, his international reputation has grown steadily. He has exhibited in many international exhibitions including “Japanese Avant-Garde 1910-1970” (Centre Pompidou, Paris, 1986), “Japanese Art After 1945: Scream Against the Sky” (Yokohama Museum of Art, Japan, 1994, before travelling to the Guggenheim Museum, New York), and “Requiem for the Sun: The Art of Mono-ha” (Blum & Poe, Los Angeles, 2012), to name only a few. He was the subject of major exhibitions at museums in Europe and the United States; a solo exhibition at Pirelli HangarBicocca in Milan, Italy (Sep. 29, 2016 – Jan. 29, 2017); a two-person exhibition with Karla Black at The Scottish National Gallery of Modern Art in Edinburgh (Oct. 22, 2016 – Feb. 19, 2017); and a solo exhibition at Dia Art Foundation in New York (Nov. 5, 2016 – Jul. 29, 2017). And this year, he is selected for the 57th Venice Biennale “Viva Arte Viva” Curated by Christine Macel (May 13, 2017 – Nov. 26, 2017). His works are held in the collections of numerous museums within Japan including the Museum of Contemporary Art Tokyo, and international institutions such as the Tate Modern, the Dallas Museum of Art, M+, the Guggenheim/Abu Dhabi, the Glenstone Foundation, the Pinault Collection and numerous others. In January 2016, he won the 57th Mainichi Art Award, one of Japan’s most prestigious cultural awards. If we look at the way “things” exist as themselves, there is always a situation of “interdependence”. When we try to think about a thing, or a situation, many “things” come as attached to the thing that we want to see. What makes it complex is that each thing, whether I get involved directly or not, brings about a presence and sense of reality for it to be “real”. It has its own orientations, and its state claims that it must exist there as it is. Sometimes it looks simple and sometime complex, but they all rely on “interdependency”. There are some things that are directly connected with the thing I want to use, and others are indirect and concealed. If it simply exists there, I would be able to present things (work) easily, but in reality that is not the case. Because we have a premise of “interdependency”, I have to look for the locations each time. That’s why I am always wandering between existence and non-existence. Finally, we are happy to exhibit six of the Suga’s rare “envelope drawings” (1990’s). Below is the commentary Suga prepared for his envelope drawings when exhibited, outside Japan for the first time, at Cabinet Section, Art Basel Hong Kong 2018,. In my practice I believe that any materials can be used in creating works, whether it may be three-dimensional or two-dimensional. Even a postage envelope can be considered as a usable material. Nevertheless, as envelopes are not meant for drawing on due to them already having something printed, names and addresses written, or depicting some form of design or pattern across their surface, it is indeed necessary to change our perspectives. To use an envelope as it is, one must do something about the signifié. One must of course erase it, and this very process is what inevitably gives rise to the act of drawing. It is a matter of erasure and occurrence in which one erases through means of expressing at the same time. Another important issue is that an envelope has a sachet-like form, and thus also contains a space inside it. The spatiality differs according to what is enclosed inside and is never at once retained in the same manner. This is something that I always have in mind when working with an envelope. When I paint something on its surface or make any form of small addition I consider how my actions would not only influence the outside, but also the space that is within it. In this sense the invisible space is also constantly included in my expressions. It is my understanding that the works reveal themselves equally on aspects of two-dimensional and three-dimensional, and visible and invisible.